Now that we’re officially in the second half of 2017, it’s time for a little personal check-in. What intentions did you set for your fitness this year? Do you feel better about your health than you did a few months ago? Hopefully you’ve picked up new practices that make you feel good (like using cauliflower rice) and ditched ones that don’t. Or maybe you’ve been too distracted to start anything yet, and time is getting away from you. If that’s the case, set a simple goal you can knock out easily to gain some momentum. It’s a great way to find instant motivation, especially when you see how quickly the body responds to positive changes. One of my intentions this year has been to shift the basis of my meals from carbohydrates to vegetables, and include more healthy fat. This recipe does both. Cauliflower is high in fiber and low in calories, and contains some unique nutrients, like choline and sulphoraphane, that protect against disease. Due to its versatility, it’s become a popular replacement for many high-carb recipes, like healthy pizza crust. It’s even being used frozen to add creaminess and up the nutrition in smoothies. Cauliflower is a simple ingredient that brings variety to healthy dishes. And you probably have another secret weapon hiding in your fridge—hummus. We all know it’s great for dipping veggies and helping us eat too many chips, but what about using it as a shortcut for making healthy sauces? Most of the work is already done for you. Just add a couple of ingredients to reach your desired consistency and flavor, blend it together and it’s ready to go. Use it on stir-fry, quinoa, tacos, or anything that goes well with a creamy sauce—basically, everything. The hummus industry has seriously stepped up its game over the past several years, so there are plenty of flavors to choose from. And while we’re thankful to Sabra for paving the way, there are newer brands (like Blue Moose of Boulder) doing it better. Their hummus stays fresh through the use of Cold Pressure, or High Pressure Processing (HPP). This eliminates the need for artificial preservatives like potassium sorbate, and high heat which can damage nutrients. This recipe uses the Smoked Chipotle Hummus flavor, combined with coconut milk, ginger, cilantro, and a touch of maple syrup. 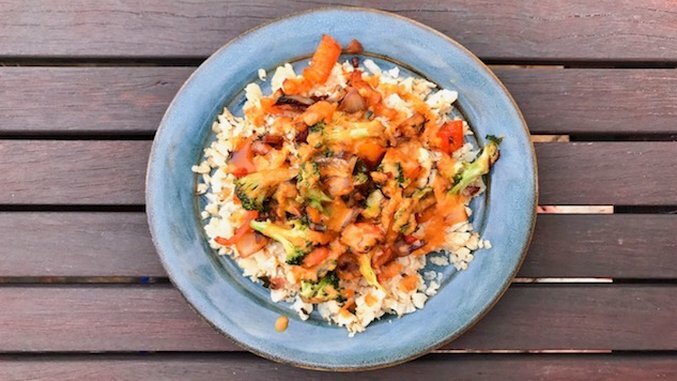 It gives a spicy kick to this cauliflower rice, and turns a big bowl of veggies into quite the party. -Add all of the sauce ingredients to a food processor and blend until smooth. -Wash cauliflower, dry, and break into florets, food process florets into rice. You can also use a large size cheese grater by hand. -Heat 1 Tb oil in a large sauce pan and sauté broccoli, onion, bell pepper, and garlic until tender, about 10 min. -Add Bragg’s Liquid Aminos and sauté another 5-7 minutes until veggies start to caramelize. Remove from pan. -Add 1 Tb of oil to same pan and add cauliflower rice. Cover pan and cook 5-8 minutes. -Serve rice in bowls topped with sautéed veggies and hummus sauce.